What better way to welcome people into a community than with a huge food fight challenge? Well that’s what we do in Roxburgh, Central Otago. During summer the population of Roxburgh (usually about 500) explodes with hundreds of seasonal workers arriving from all over the world to work in the orchards. Seasonal workers are an important part of the community and the local economy, and it is important that they feel welcome, valued and connected. Arriving in a new place can be a challenge, particularly when you’re living and working in a different country and a different culture. 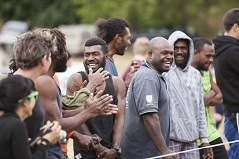 Local community group, Teviot Prospects, wanted to come up with a way to welcome their international workers and give them an opportunity to connect with locals and other like-minded visitors. They wanted to develop a fun and engaging event to get as many people to take part as possible. It needed to be something that visitors and locals could join in together in a relaxed environment to build connections and have some fun. The idea of a food fight challenge was floated…and Cherry Chaos was born. It was perfect – a celebration of the fruit harvest and a fun event for the whole community to enjoy! Lots of work went into developing the concept, planning the event, and finding equipment and produce. Members of the group worked hard to make sure the event went off without a hitch, health and safety requirements were met, volunteers organised and the event promoted to the masses. Local orchardists were hugely supportive providing the fruit, sponsoring teams and giving their workers time off to compete. The produce used for the event was only suitable for stock food and not fit for human consumption. They were simply intercepted for a day of fun and then put back into the food chain. For the main event teams of six people completed an obstacle course against the clock, while opposing teams pelted them with cherries. 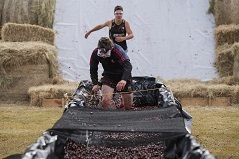 Scaling walls (while slipping on cherries), crawling under nets (through squelchy cherries), pushing teammates in wheelbarrows (being pelted with cherries) and navigating drums and crates full of messy cherries was all part of the chaos. And the result? 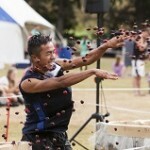 A hugely entertaining mess of cherries with everyone having a fabulous time – competitors and spectators alike. Competitors said, “we’re having a blast”, “it’s so much fun”, and the sheer joy on their faces confirmed it. 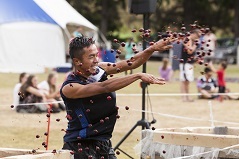 Getting in a cherry mess is not everybody’s cup of tea, so those who didn’t want to ‘run the gauntlet’ were able to take part in a number of other activities, or simply watch on and enjoy the atmosphere. Stalls provided refreshments and hot food, and a local band entertained the crowd with live music. ‘Slingshot Hit the Spot’ and a horizontal bungy were fun activities for younger people to take part in. A Cherry Cooking competition with ‘cherrylicious’ categories of pies, cakes and condiments saw many delicious creations entered and was very popular with both entrants and judges! The entire event was such a success that Teviot Prospects are planning for it to be an annual fixture in the area’s event calendar – and who knows, next year could be even bigger and better!